I hope you find On Texas™ as interesting as I did photographing all over Texas for most of my adult life. I bet many of you will enjoy seeing Texas in all its uniqueness and not a limited stereotype based on the past. After all people in Texas helped send men to the moon and back. Copyright © 2014 Byron Rogers. All rights reserved. The process was straight forward as I first chose images that where made in Texas. This was the first group or edit and there where several hundred after looking at all the transparency archives of my life work. On the second edit I chose images that moved me; images that I really liked and images that raised questions. With the second edit group there where less but I am not sure how many. With the third and the current group of 137 images I only chose those that fit some how, that where strong and I removed any that did not go with the collection. I think there will be another edit after I go through my negatives and add from the negatives to this collection of 137 transparencies. 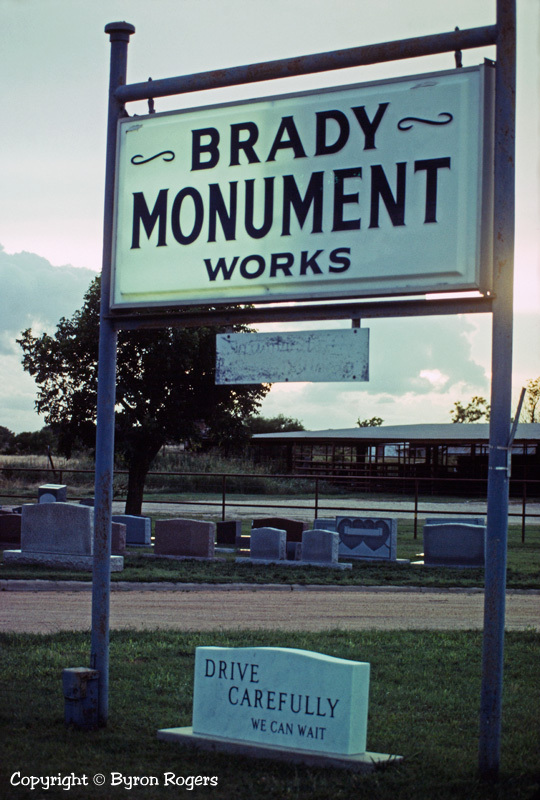 I am looking forward to completing the final collection of images including transparencies, negatives and digital captures that will make up the finished On Texas™ photographic essay. The plan is to make a monograph with all the photographs including as much information as I can remember, find, authenticate and add to each image rounding out the volume. The information will not include f-stop, shutter speed, focal length of lens but may include film type or digital capture as the original source of the image. I will try to date each image because they were made over several decades and I believe dates help place what was going on in my life and the life of Texas and the nation. When the book is ready it will be announced here on this website (On-Texas.com). I have no ideal how long it will take to finish the book so watch this website. You can also subscribe using RSS or your email by filling the form below on the bottom left.